Bear Hound Decal Bear Dog Hunting Decal Small 6″x 3″ Medium 12″x 5.5″ Available in White, Black and Chrome. Additional charges include $1.50 for Chrome and $1.00 for Medium size. 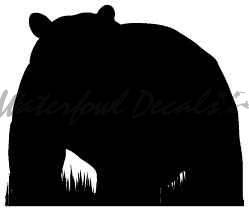 Bear Track Bear Print Decal Small 4″x 4″ Medium 8″x 8″ Available in White, Black and Chrome. Additional charges include $1.50 for Chrome and $1.00 for Medium size. Bobcat Decal – Bobcat Jumping Off Small 6″x 6″ Medium 8″x 8″ Available in White, Black and Chrome. Additional charges include $1.50 for Chrome and $1.00 for Medium size. Coyote Sticker Small 4″x 3″ Medium 10″x 8″ Available in White, Black and Chrome. Additional charges include $1.50 for Chrome and $1.00 for Medium size.